A colorful fall dish with a hint of sweetness. This colorful vegetable gratin is a mixture of all your favorite fall vegetables. 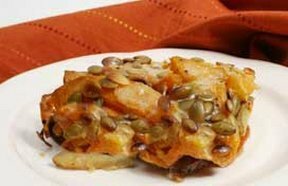 This tasty side dish is topped with toasted pumpkin seeds, which add a little crunch and a touch of nutty flavor. This is sure to be your new favorite fall dish. Whether you are peeling, coring, cutting, or slicing, let our apple preparation guide show you how. See how easy it is to make your own applesauce from all of your favorite apples. Mix and match different varieties to create your own special flavor.